Fierce negotiators. Our deep knowledge and decades of experience will guide you throughout the process to ensure you are successful in getting your offer accepted. Excellent communicators. We will get you the information you need efficiently and promptly in the style of communication you prefer, whether it’s email, text, phone and/or face-to-face meetings. Strong advocates for your needs. We always put your needs first, and the beauty of our team is that when one person isn’t available, the other seamlessly steps in to help. Experienced and energetic agents. We are reputable, honest and passionate agents who enjoy what we do every day, which is a crucial part of our success. Superb networkers. When you work with us, you don’t just get access to our services but to those in our network of professionals. This includes, but is not limited to: legal advisors for full guidance throughout your projects, a certified mediator specializing in conflict resolution for support during difficult transactions, and an innovative marketing department that caters to each project uniquely and efficiently. Experts on the Bay Area. We work not only in the East Bay but also across the bridge in Marin, San Rafael and Tiburon. We have extensive knowledge of the Bay Area and can help advise you on the best locations for your needs, whether its a single family home or investment property. We keep our clients informed during the entire process to ensure that they are completely satisfied and as stress-free as possible. Unlike other agents, we don’t let communication with our clients fizzle out midway through the process. We give you as many updates as you desire, and are available weeks, months, and even years after the transaction is over. We only work with the best lenders, inspectors, designers, and other professionals. We work to build your trust and develop a relationship that will outlast this transaction. We represent an equal number of buyers and sellers, which gives us insight into both sides of the transaction. As a result, we know exactly what sellers are looking for as we help craft your offer package. We are always learning and implementing new ideas and technology into our business to ensure your transaction goes as smoothly as possible. We are creative, outside-the-box thinkers. In a competitive market, this helps us stand out from the stack of offers a seller may receive. We work hard to ensure we do everything we can to make your offer win. We love stats. We work hard to ensure you are educated about the market and know what to expect. We love what we do and we often exceed our clients’ expectations. Feel free to read our 5-star reviews on Yelp, Zillow and Facebook. Red Oak Realty is one of the largest independent real estate brokerages in the East Bay. The company’s agents work with over a thousand buyers each year, and we keep in touch with those agents to get a real- time understanding of the current state of the market. We are a hyper-local independent brokerage with national connections. We are a member of Who’s Who in Luxury Real Estate and were handpicked to be member of the Leverage Global Partners network. These exclusive associations ensure our ongoing relationships with the top brokerages around the world. We offer support via our two sales managers, and we have a five-person transaction team that handles all of our files in an a fast, efficient and highly ethical manner. If you would like more information about us, what we do, and what we offer, please don’t hesitate to ask. Our team is available to sit down with you to discuss any questions or concerns you might have. Feri grew up in Tehran and moved to the United States at age 18. A UC Berkeley graduate, she holds a master’s degree in fine arts and brings an artist’s sensibility to her professional real estate career. She started as a real estate agent in 1978. 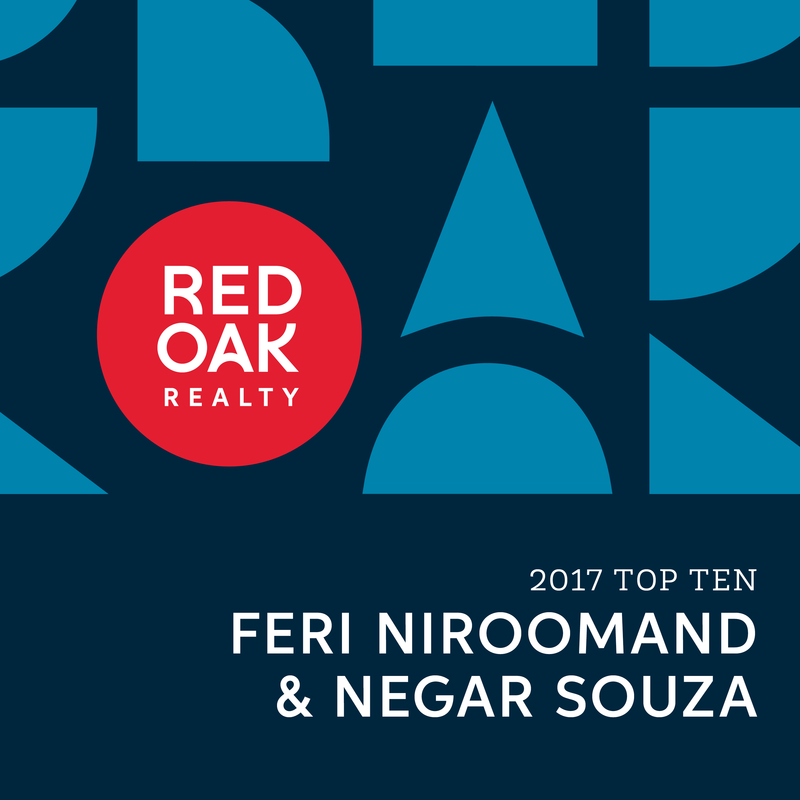 Feri Niroomand has spent more than two decades at Red Oak Realty, and her daughter, Negar Souza, joined her in 2003. Since 1996 they have successfully handled more than 450 transactions in residential and commercial real estate, representing over $400 million in sales. Feri describes herself as friendly and straightforward. She works in both residential and commercial real estate, a rarity in the business. “I recognize that these are very different skill sets,” she says, “but I find that each discipline can actually complement the other, creating a more well-rounded knowledge base. Their vast knowledge of the entire Bay Area and it’s real estate markets has landed them many accolades over the years. They were named Red Oak top producers in 2004, 2005, 2006, 2014, and 2016 and, 2017, and won the manager’s award in 2007 and 2008. Negar was the top lead management agent in 2016, and they were the top-producing team company-wide in April 2017 and June 2018. She received her BA in interior architecture from San Francisco State, started as her mother’s assistant in 2003 and became a licensed real estate agent in 2005. In 2017, Negar propelled herself into the top 5% of agents in the entire East Bay by volume and is now a Certified Residential Specialist, (CRS), a designation given to only the top 3% of all agents Nationwide. She is also a designated Senior Real Estate Specialist, (SRES), offering more expertise to those who fall into the 55 or older generations. Negar resides in the El Cerrito Hills with her husband and three beautiful children. She is extremely active within her community, sat on the advisory committee at Red Oak, volunteers at her children’s schools and is affiliated with various local executive boards.